Riley my dressage horse is also Riley, Destroyer of Fans. As a three-year-old, he was on stall rest for most of the winter of 2009/2010. One barn he was at left the fans up, and when they turned them on in May, Riley's wasn't working. The barn manager found that the cord had been chewed in two -- in three places. Last year, despite efforts to secure the fan in such a way to discourage fan-play, Riley managed to wrap his teeth around the edge and he crunched down on it. The blades made such a racket we all came running. Riley 2, Fans 0. This year, the barn handyman rigged up a fan holder . It has wire mesh to prevent Riley from touching it through the bars and a frame to keep him from hurting himself on the mesh. 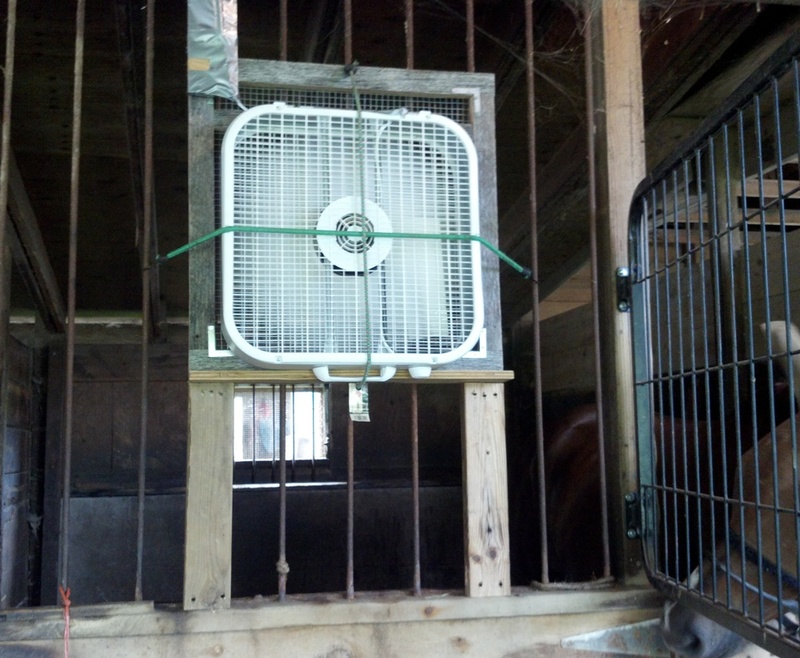 We ran the cord up a board on the outside of his stall and wrapped it in duct tape. To get the cord to the power outlet we slit garden hose, wrapped it around the cord, and duct-taped it shut. That is one beautiful job. How clever. Hope it works. My Boys, fortunately, leave their fans pretty much alone. They are floor fans that simply stand in the aisle by each door. Once in a while one gets nosed over, but so far, so good. Wonder what Riley figures he's doing when he gets into destructo mode? Good thing he didn't get shocked. You know, that fan arrangement caught my eye the other day in a photo you posted. I thought it looked a little funky! I hope all your anti-Riley engineering results in a cool horse who's not busy trying to electrocute himself, silly fellow.